It’s December 14th, and some of you have your gift shopping done, while others are just beginning. If you’re feeling panic-ed about finding gifts for everyone on your list, I highly recommend focusing on books. Why? Because there’s a book that makes sense for everyone out there. Every age, every interest, every reading level. From heavy novels, to how-to guides, to books that are almost like toys. Plus, many (or most?) are available under $20, and they ship really quickly. Hooray! 1) For the animal lover (or the soon to be animal lover). Do unto Animals. The more we know about the animals in our world, the better we care for them. This is a sweetly illustrated, friendly guide. It’s written by Tracey Stewart (wife of Jon Stewart). I invited Tracey to speak about her work with Moomah at Alt Summit a couple of years ago. I’m a big fan of hers! 2) For the non-traditional new mom. Mama Tried. This is for the pregnant woman who isn’t feeling all rainbows and unicorns about the situation. From New Yorker cartoonist, Emily Flake. 3) For the designer. Tile Makes the Room. Are you familiar with Heath Ceramics based here in the Bay Area? This book is by Heath’s owners Robin Petravic and Catherine Bailey, and it’s gorgeous. A coffee table book for the design lovers in your life. 4) For the doodler. The Secret Garden. Probably the most popular of all the grown-up coloring books. It’s printed on thicker and heavier paper stock, to prevent bleed-through from ink pens. The Secret Garden theme also comes in postcards, journals, and calendars. All made for coloring in. 5) For the stylish maker. Everyday Style. This is the latest how-to book from Lotta Jansdotter, the Brooklyn-based, Swedish designer. This book features 25 really cool, modern sewing projects. Each pattern includes lots of options, and she includes fabric sources too. 6) For the young man who is just learning, or the older man who needs a refresher course. The Art of Manliness. I wasn’t sure what to think of this book, but with over 300 positive reviews, I went for it. And it’s good. 7) For the traveler. See San Francisco. Victoria Smith of sfgirlbybay.com wrote a love letter to the city. It will make you want to book a flight asap. 8) For pre-schoolers. Caps for Sale. Written and illustrated by Esphyr Slobodkina. It’s the 75th anniversary of this book. Do you remember it from Reading Rainbow? You could also get this newly published sequel, More Caps for Sale, and give them as a set. 9) For 7 to 11 year olds. 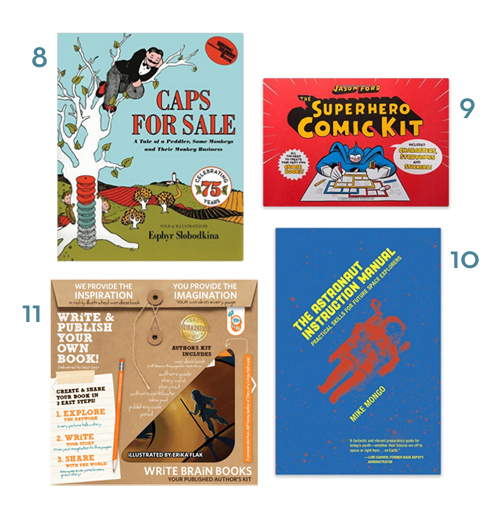 Superhero Comic Kit. Big oversize book, with lessons on how to draw your own superheros. Girls and boys. Villains and heroes. 11) For ages 5 up — or pretty much anyone who dreams of writing children’s books. Author Kits from Write Brain Books. The illustrations are already done. It’s up to you to write the story. And you can publish it too! Okay. Now it’s your turn. What books are you gifting this year? Any that you’re particularly excited about? I’d love to hear! P.S. — For toddlers, see my list of best-designed board books. I might have mentioned in prior posts, but my son broke his femur skateboarding this summer. This surgery is to remove the plate and 8 screws in his leg. He was worried his injury would affect his astronaut potential, but the surgeon told him that kids have gone on from this type of injury to be athletes and Air Force pilots, so why not! Mrs. A, share with your son that being 8 he is the perfect age to be first in line for tomorrow’s space jobs, and that by the time he gets out of college space jobs will be about anything he wants to do on earth–space firefighter, space doctor, even space athlete or space plumber! And wish him fast healing from me. It makes me happy to hear someone as excited and determined to live, work, and play in space is reading The Astronaut Instruction Manual–let him know: I did wrote it for him! Oh, my goodness! Thank you so much for your reply. My son is going to be over the moon when he hears that an actual author is wishing him fast healing (much less an author of a book on one of his favorite topics). And, you have certainly made my whole day. I have started reading your book (and love it). I am now doubly a fan! You son! That sounds like major surgery for an 8 year old. Wishing his health and strength! We love Caps for Sale. I’ve had my eye on Secret Garden for a few weeks…for me! It’s so pretty. And #6 for a certain gentleman I know. :) Great choices! The whole Secret Garden series is so well done! Husband- Evangelical Theology textbook for his masters program. I got the first two books from our new local, independent bookshop which I’m excited about. This is a great idea, books for everyone! My 16 year old daughter did this exact thing this year for her closest friends. She picked up her books at Urban Outfitters, based on the likes of everyone. The gifts were a hit! I think I need to expand this to the rest of the family. Love the idea that the “what do I get” is taken care of – always a book! – but the choice can still be personal. ‘The Americanization of Edward Bok‘, the autobiography of Edward Bok who was the creator of Ladies Home Journal and the founder of Bok Tower Gardens in Florida. A really interesting and enjoyable read! I bought it for my MIL after a visit to the gardens. The Greater Journey: Americans in Paris by David McCullough – about the lure of Paris on American artists, writers and doctors in the first half of the 1800s and the historical impact this had on both Paris and the United States. So, so good. One of my favorite books. I am getting it for a fellow history teacher. Smile by Raina Telgemeier. I’m getting this for a friend’s daughter who is lacking confidence after getting braces. It’s a true-story graphic novel about the author’s 6th grade struggle with self-esteem after she falls and Knocks out two front teeth. My 3rd grade daughter loved it and has recommended to numerous friends. What an awesome list, Katey! Thanks for the recommendations. Smile is part of our family library as well. It’s a good one. And I’ve never heard of Edward Bok and find myself very curious! Thanks for the ideas. I’m thinking about The Art of Manliness as a choice for a young man who is graduating from college next week. I’ve never read the secret garden! I really need to get on that this year. I think having The Astronaut Instruction Manual included in such spectacular company as Secret Garden and (gasp) Caps For Sale has made my Christmas. 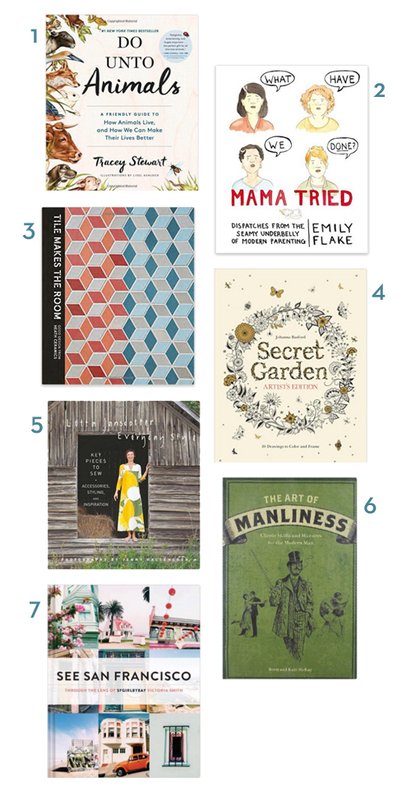 All excellent books, and an equally lovely list. Thank you, Design Mom! Blowing metaphoric kisses from space to shower your work in earthly Oakland. Merry happy everything to all the future young space explorers, wherever they may call home! Thanks for commenting, Mike! Always fun to hear from the authors of books I feature. So glad you happened upon the post. The Art of Manliness is a blog. I’ve read it (and I’m a woman) for its etiquette posts on writing letters (thank you letters, sympathy letters etc.) and found it well done and while they clearly post some topics that would be of more interest to men (beard shaving tips etc.) I think it is a fun, but useful site and bet the book is the same. Yes! The blog was my first introduction to their work. Also very good. You made my day, Stephanie!